One of the things I've been experimenting with the past year or so is computer based surveillance of house and home. Software driven CCD chips have made this stupid inexpensive. You can get digital cameras for about $10 to $30 if you shop around a bit and wait for sales. Or just free more and more if you get lucky and know what to look for. There are wireless models too, but they can cost a bit more. They're considerably higher resolution than NTSC standard video and images are 24 bit so they'll stand a lot of post processing to bring out details. The Logitech ones can be hacked for infrared night vision and some of the full color ones will work well at night. You can place them wherever you want, as many you need, because they are so cheap. They're also quite small and can be hidden anywhere to monitor your home, indoors or outdoors. Just be sure to cover up any LEDS on cameras you want hidden. Leave one or two showing their LEDS as a sign though. There's no deterrent in security surveillance if no one knows its there! You can also put microphones up. There's endless flavors and variations of software to support the digital cameras so its easy to find exactly what you need. They offer motion detection recording, straight recording, time lapse recording, audio recording, etc.. The output can be logged to anywhere, a home based server, any one of a number of free webspaces that have enough capacity to store a year of logging from several cameras and microphones or burned off to CDs. The compression software allows quick logging in real time or periodic batch logging. A lot of the software is free on the web if you look around. There's crazy hacks who write smarter and smarter software and just give it away. Your imagination is the only limit on how the new tech is used. Just keep in mind you need a foolproof way to store the information and let yourself and those you choose find events of interest. It takes some thought. I won't offer my method here for obvious reasons, just give it some thought. Its not that hard to store the information safely offsite on the web and then let others you choose find it. I recommend storing the information onsite as well as at two offsite locations on the web. You likely want to give someone else the "key" to at least one storage site and not have one for this site yourself. Can anyone figure out why? This never would have occurred to me had I not found the service offered at a security web site in the U.S.. Its so no one can force you to erase the data. Look around and do a bit of other reading on the topic to decide just how to use the tech is best and easiest for you. A little work to set it up and it runs itself 24/7 365. Laptops are good computers to use since they'll switch to batteries automatically if the power goes out. I offer this mostly for those of you who would like to use the new cybernetic eyes as tireless sentries of your home. However, I also offer it as warning to anyone who thinks they can get away with doing things covertly. This kind of thinking is quickly becoming obsolete and I honestly think, so long as it doesn't invade anyone's privacy the new tech will create saner safer communities. The infrared cameras can reveal details underneath clothing or disguises. The new tireless cybernetic sentries are everywhere now. Some neighbors and friends are beginning to also use it on their property. So there's likely more than one eye watching and more than one ear listening at any given time, with time tags. You never know when you're being watched or where! Chances are some of the things we do in public are recorded in the smallest detail. License plates, faces, engine and wheel sounds, voices, gunshots, etc. can all be used by the police and in courts to catch a criminal and punish them. Digital processing and infrared CCDs can be used to reveal details human senses could not capture. You can't really turn your house into a fortress because firemen and paramedics have to be able to break in should you be unable to let them or not be there. The legal or necessary forced entries. The "cyber-sentries" offer a measure of security along with modern communications, internet, telephones, cell phones that's likely better than your own little fortress castle. Its just starting, but, there's even a capacity for the systems to call 911 faster than you could and show them real time surveillance while your asleep or not even there. I haven't tried yet (soon though), but, it looks like it would be simple to send video to any cell phone you choose. The hardware's all there and the software just gets smarter all the time. So give it a try. Start simple. Pick the technology you can figure out. A lot of the basic stuff is "canned" if you look around. If you already have a wireless network at home it makes things a lot easier and its good practical use of all those toys you pay money for. There are wireless motion detector, night vision ones which will interrupt your television viewing with scene and audio. They're cheap, spit simple and don't use a computer, just your television. One friend uses one of these as an automatic doorbell when people come to his house. There's some good application for hearing impaired and otherwise challenged people or the elderly. Its also amazing how this tech extends your senses and awareness. I've learned many interesting things about what goes in my neighborhood, like some squirrels are out and about in the dead of the night. I always thought the paper was delivered around 6 6:30 AM. Turns out its around 5 AM. Good! I can go for it earlier. With the internet you don't even have to be home to access the system. You can do it from any internet portal, like at work in your office. You could keep an eye on your loved ones at home from the other side of the planet in real time if you wanted to. I don't think it would be a legal substitute for a babysitter though, in case any of you are thinking this. At least not yet. A pal of mine, more or less by accident, caught his wife sleeping with another man using this technology. So be careful. You don't want to go finding out things you didn't want to know or invade someone else's privacy. Not only because its not cool, but also because you'll get caught by their tech and get thrown in jail. I think the rule of thumb should be only on your own property and adjacent public property. If you could see it or hear it in person looking out a window then you're not invading anyone's privacy. The opposite side of this is, don't expect to not be under surveillance if someone could see you out their window. This seems a reasonable and logical application and expectation from the technology. Don't be a dufus and put surveillance in your bathroom or any other place other people would have an expectation of privacy. There's people in jail for doing this! There's this perfect rewind or perfect memory of events with the technology. You don't have to burden your puny human brain with the work of this. Its an amazing extension of awareness. Things like the motion detection features, either as it happens or from a recording, make noticing and "remembering" a lot of things easier and quicker. I now know the habits of the neighborhood cats at night. And a free roaming dog or two. The squirrels doing their thing in the middle of the night still freaks me out. They're a lot like us in many ways. I also seem to notice the rhythms of day and night a lot better. I offer the examples below from the one I have pointed on the front yard and street. Most of the time its just a ho hum shot of the front, especially during the day. 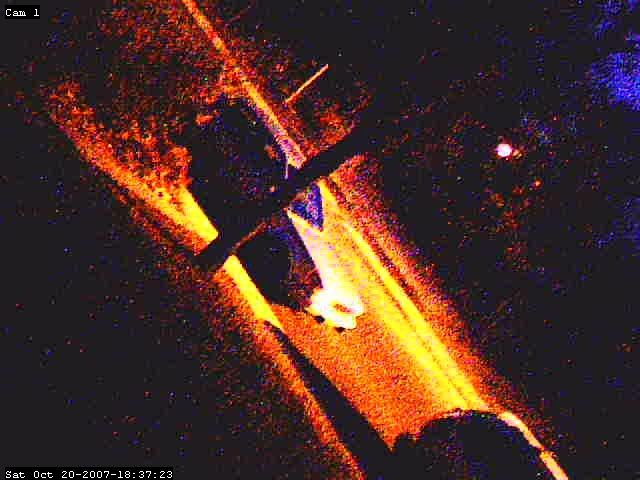 But, there's an extraordinary image quality to the color night vision. Its like chalk or pastel drawing quality, which is really cool in the moving video. I wish I had enough space on this website to indulge in video. I can hear the Ah ha song "Take me Home" when I watch the night stuff. (Its starting to get annoying that song in my head. I hope this goes away.) When I'm anywhere near the monitor at night, even the slightest motion really catches the corner of the eye for some reason too. That's how I noticed the squirrels. Oh yeah, before any one says, "Hey! The camera should be straightened out." After a few weeks of the camera being level I realized the longest axis is the diagonal and this should be set to catch the longest swath of the street. It doesn't have to be level for security purposes. It also helped aim the camera a little more away from the sun during the day. Think about things like this as you try it. Use your slide bar at the right of the browser to scroll through this. 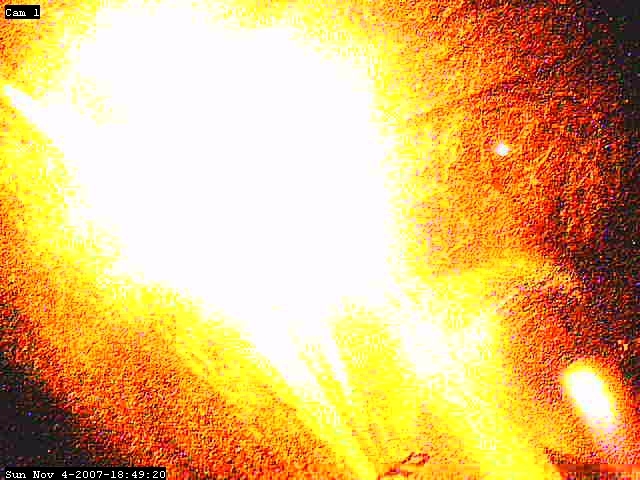 Night vision shot. This is just with the streetlight. With the front light on its like daylight. There's a very cool effect with the color night vision for a brief interval just when the light is turning from day to night or vice versa. Some of the color night vision stuff is pretty darn cool if you find just the right frame. 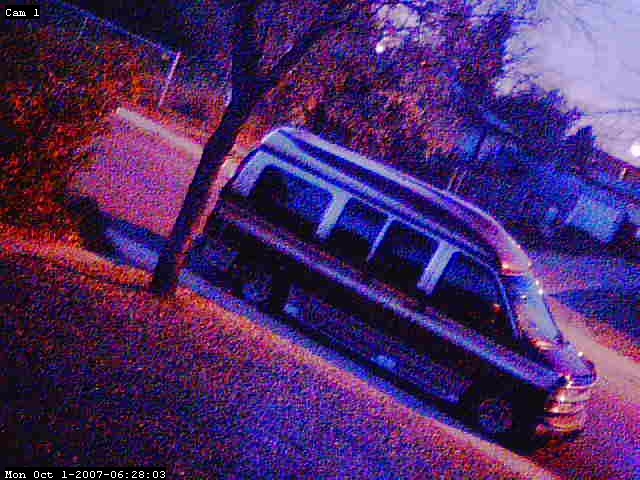 This is a car turning around in front of the house at night. Its art! I wonder, am I making the art or are the machines? Maybe its a collaborative effort? There's also eyes in the sky for your home and surroundings. Not only aircraft equipped with the latest and greatest surveillance tech, but satellites looking down 24/7 365. Clouds, night, rain, snow, etc. are nothing to the infrared CCDs. We, our vehicles and homes glow like neon signs in the infrared. Vehicles and even people can be identified and have their movements tracked. The military has had access to this technology for quite awhile, but more and more of it comes into civilian hands all the time. I haven't done a lot of this yet, but, I have a web pal in the U.S. who has access to some remarkably detailed, perhaps still classified, images of most of the planet. Look around on the web if you're interested in this. 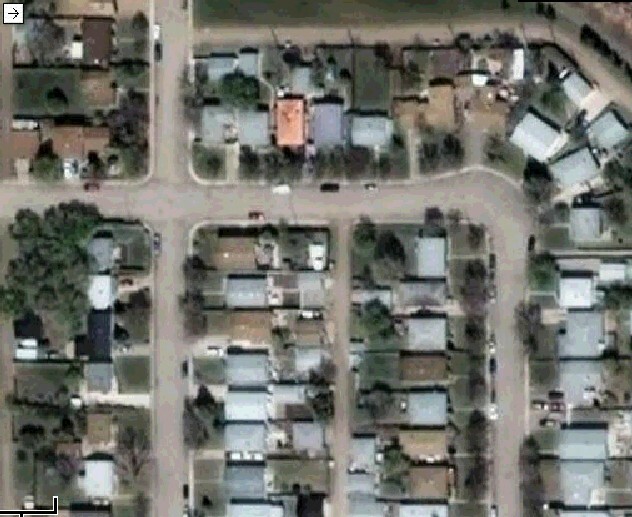 Below is a fairly low res image of my neighborhood in normal full color vision. With some of these images I have also learned some interesting things about surroundings. Regular law abiding citizens have nothing to fear from this tech. There's no liberties lost in surveillance of public spaces and you watching your own private space. There's only security to be gained. However, the crooks, weasels and skulkers in the shadows just hate this technology and the many smart imaginative ways it can applied. Also, being not very smart most of them get overly focused on the tech and forget there's still all the normal human eyes and ears around. I've seen this happen many times in department stores and casinos with all their surveillance. They can't hide their actions, who they are or where they live anymore. Brave new world indeed!